CLEVELAND — A month in which the Cleveland Cavaliers?gave up 125 points or more a whopping five times, lost All-Star forward Kevin Love to a broken hand, saw marquee trade acquisition Isaiah Thomas be slow to return to top form and had an argumentative team meeting leak and become fodder for the sports world for days mercifully closed on a high note with a 91-89 win over the Miami Heat on Wednesday. Wade had other reasons to want to turn the page from January as both his agent, Henry “Hank” Thomas, whom he considered a father figure, and former Miami Heat teammate Rasual Butler died. A fresh outlook would be overwhelmingly welcome for a Cavs team that has lost its way after winning 18 out of 19 games from mid-November through mid-December. 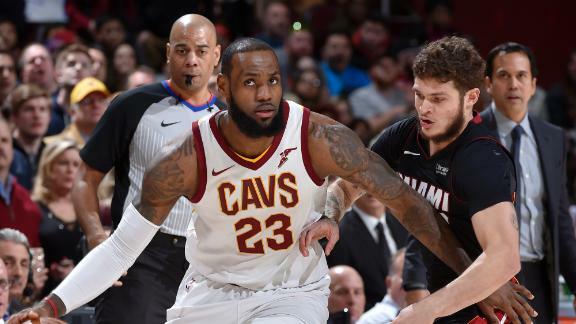 February will feature more opponents like Miami — a team that is nipping at the Cavs’ heels in the standings after coming into the night 10-4 in January. Cleveland opens February with the Houston Rockets, the No. 2 seed in the West. The Cavs also play the No. 1 team in the East, the Boston Celtics, as well as the No. 3 and No. 4 teams in the West — the San Antonio Spurs and Minnesota Timberwolves — before the month ends. As challenging as the road ahead promises to be, there was a feeling in the Cavs’ locker room after Wednesday night’s win that it can’t be any worse than what they’ve already been through. Making up for Love’s absence — sources told ESPN he could miss six to eight weeks — will be paramount moving forward. Several Cavs mentioned a “next man up” mentality being necessary. But LeBron James isn’t putting personal pressure on himself to perform differently without Love. Read into James’ comments what you will. It could be that he’s sending a message to the front office that they can’t expect to patch up the hole that Love’s absence creates by expecting a little bit more from the rest of the roster that’s already in place. There’s another thing to look forward to this month, of course: the trade deadline on Feb. 8. How Cleveland handles any potential deals between now and then ultimately could make or break the Cavs’ championship chances. Maybe that’s why James wasn’t quite as celebratory as some of his teammates about the simple fact that the calendar changed from January to February. “It is what it is,” James said. “I don’t wish for days to be gone or want to get to the next month. I’ve always lived in the moment and this is basketball, but there are other things bigger than that. I’ve had an opportunity to do a lot of great things in this month. Obviously the game of basketball has been tough for us this month, but that’s not the end-all, be-all for me in my life.